More from Ora: Anne Heche on motherhood, Johnny Depp, and "catfights"
Leadership and communication expert Simon Sinek makes the case for why we should all find fulfillment in our work, breaks down strong leadership, and defends millennials in this eye-opening interview. 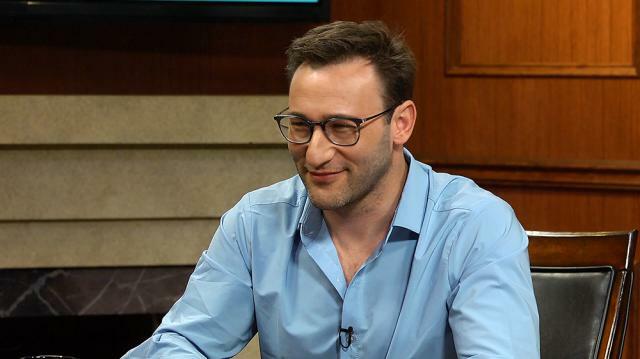 Larry chats with Simon Sinek, a motivational speaker, ethnographer, and author of three New York Times bestsellers: Start With Why, Leaders Eat Last, and his latest inspirational book Together is Better. His TED talk on the concept of “why” is the third-most-watched of all time, and his website is startwithwhy.com. Larry begins by asking Sinek about ethnography, and Sinek explains that he majored in anthropology due to an inspirational professor and an interest in Western urban culture. Similarly, Sinek fell into writing when he lost his passion but pretended otherwise, and finally gained the courage to find a solution and discover why he did his work. Once he found the answer, his passion was restored to new levels and he was invited to talk and write about his journey. After a quick meeting with business publisher Adrian Zackheim, Sinek secured a book deal. Larry asks about a subject in Sinek’s books: finding fulfillment in work. Sinek believes work fulfillment is a right, not a privilege, and that leaders should provide an enjoyable work environment. He believes this applies to anyone in any job, giving examples of happy blue-collar workers and unhappy white-collar workers. Additionally, Sinek talks about the importance of teamwork, and of balancing individual and group interests. Larry questions if it’s hard for Sinek to be an optimist. Sinek thinks the world is okay, saying that much of it is dependent on perspective. Larry raises the perspective of people disappointed in the election, and Sinek believes one good result was that people became more involved and unified in opposing things like the travel ban. The conversation turns to millennials, and Sinek says that every generation is affected by the world environment during their formative years. He is concerned about millennials’ unfettered access to social media, which can be addictive. Larry cites this addictive potential as the reason he has a flip phone, and Sinek emphasizes the need for balance and health. Turning back to business, Larry asks what good leaders have in common. Sinek believes courage is most important, and that having integrity and doing the right thing are also crucial. Larry asks if Trump has leadership skills, and Sinek says Trump can rally people, but it remains to be seen whether Trump can inspire and unite the nation. Larry proceeds to ask about the style of leaders like Steve Jobs, Richard Branson, Sheryl Sandberg, and Oprah. Sinek points out their good qualities, such as being a visionary, uniting people, and making people feel included. On the topic of inclusion, Larry asks if females lead differently. Sinek says yes, emphasizing the need for leaders with both traditionally male qualities like aggression and traditionally female traits like empathy. Sinek laments the current selfish society, pointing out that there’s a “self-help” section but no “help others” section, and highlights the importance of empathy and acts of service. He gives examples of military bonds, and Larry adds a story about Marines risking their lives for each other. Larry asks for Sinek’s definition of success, which Sinek believes is “seeing those around you work to their natural best and creating momentum towards a vision that will last beyond yourself.” Larry questions if success is what you make of it, giving examples of a bus driver and vice president and their different perceptions of success. Sinek believes success is about contribution, and repeats that this is key when Larry asks how he deals with fear. While Sinek has fears, he also has people to turn to, and he believes a healthy corporate environment is where people feel safe enough to tell their boss that they’re scared.